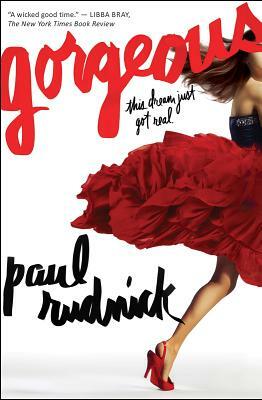 A screamingly defiant, hugely naughty, and impossibly fun free fall past catwalks, red carpets, and even the halls of Buckingham Palace, GORGEOUS is now in paperback! Eighteen-year-old Becky Randle is an ordinary girl who receives an impossible offer. She meets Tom Kelly, the world's top designer, and he promises to create three dresses to transform her from a nothing-special girl into the Most Beautiful Woman Who Ever Lived. Becky thinks Tom is a lunatic, or that he's producing a hidden camera show called World's Most Gullible Poor People. But she accepts, and she's remade as Rebecca. When Becky looks in the mirror, she sees herself -- an awkward mess of split ends and cankles. But when anyone else looks at Becky, they see pure five-alarm hotness . Soon Rebecca is on the cover of Vogue and the new Hollywood darling. Then she meets Prince Gregory, heir to the British throne, and everything starts to crumble. Because Rebecca aside, Becky loves him. But to love her back, Gregory would have to look past the blinding Rebecca to see the real girl inside. And for that, there's not enough magic in the world. Paul Rudnick is a frequent contributer to the NEW YORKER and ENTERTAINMENT WEEKLY, as well as an Obie Award-winning playwright, and the screenwriter for ADDAMS FAMILY VALUES and IN & OUT. This is his first young adult novel. "When I wasn't laughing out loud (which was often), I was wiping away a tiny tear."